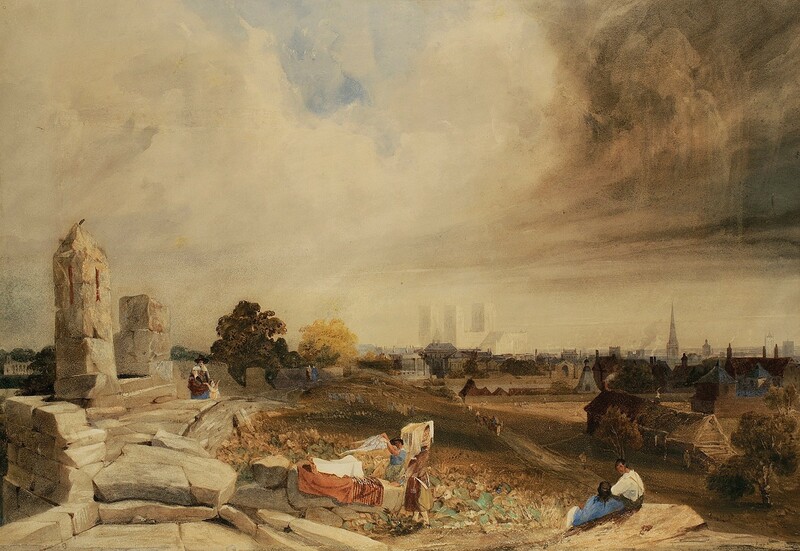 A sweeping early view of York by the 19th century watercolourist Peter De Wint (1784-1849) emerged as one of the top performers in a Dorset sale on account of its subject and rarity. Six phones vied for the work at Duke’s (22% buyer’s premium) of Dorchester on January 25, before it was knocked down to a London buyer for £9500, nearly double the top estimate. Attached to the back of the De Wint was an old 1960s exhibition label for the London gallery JS Maas & Co. The viewpoint takes in the site of where York’s first railway station stands (now part of the city council’s main office), dating the watercolour to before it was built in 1841 within the city walls and accessed by new arches knocked through. The expansive view features the outline of York Minster in the distance. According to Schwinge, the “exhibition-quality” of the work had attracted institutional interest before the sale. While De Wint views of Yorkshire crop up at auction occasionally – a depiction of Bolton Abbey took £24,000 at Sotheby’s in 2000 during more bullish times for 19th century watercolours – the artist is better associated with the county of Lincolnshire, where he later lived with his wife and set many of his panoramic landscapes and haymaking scenes. The auction included a more conventional De Wint watercolour, consigned from a separate private source. The smaller 6 x 9in (15.5 x 22.5cm) bucolic view was looser and freer in its execution, showing figures on a riverside path with a church in the distance. Estimated at £200-400 together with another watercolour, it sold to the same London buyer for £2400. 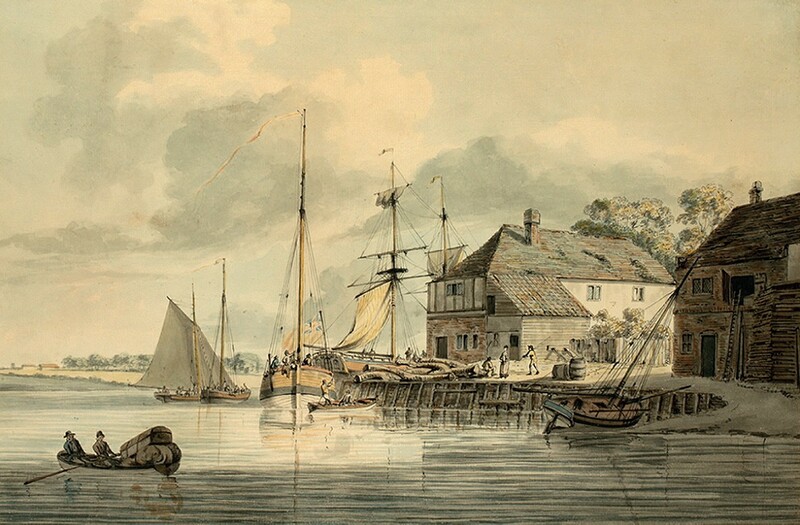 The Blandford Forum collection also contained a Dominic Serres (1722-93) picture of a wharf in Kent, described by Schwinge as a “classic early English watercolour – charming and crisp and in great condition”. Guided at a tempting £250-450, it was knocked down at £2800 to a specialist watercolour collector determined to have it. A native of Gascony, Serres arrived in England c.1745 and went on to have a successful artistic career, culminating in his appointment as a marine painter to King George III (several of his works are in the Royal Collection). Well-connected in the English art world, he was one of the founding members of the Royal Academy in 1768 and later briefly its librarian. Keen bidding emerged for Fishing Boats Becalmed, a relined 2ft x 18½in (62 x 47cm) oil on canvas by Hendrik J Dubbels (1620-76), a Dutch marine painter about whom comparatively little is known. Passed by descent into a local private collection, it sold to a private buyer on the phone for £5000, over three times the top estimate. The underbidder was from the Continental trade. The royal yacht putting into port with the royal barge and other shipping and figures on the shore, ‘ascribed’ to Peter Monamy – £4200. An oil ‘ascribed’ to the better-known English marine painter Peter Monamy (1681-1749) more than doubled its top guide to sell for £4200. It had previously sold for £1900 at Bonhams in London in 1990. The 21½in x 3ft (55 x 92cm) oil on canvas, depicting a royal yacht and barge putting into port, had come from a private collection in London. 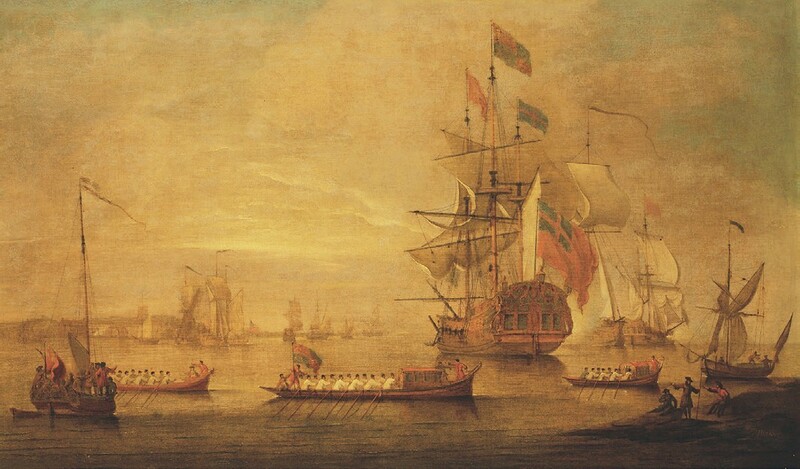 Monamy’s paintings, of which there are many, usually depict known ships but rarely record specific events as, up until 1739, his career coincided with a long period of peace. Other noteworthy results included a 10½ x 10in (27 x 26cm) oil on panel of a cottage garden by the Victorian painter Augustus Leopold Egg (1816-63), which was secured by a specialist dealer on top estimate at £2000. A decorative mid-19th century naïve school portrait of three farmyard pigs in its original maple frame was secured by a specialist dealer for £4400, over four times the top guide.